Tonight I committed myself to finding something inspired by the Dragonball manga even more ridiculous than the Dragonball Evolution movie. That’s right. 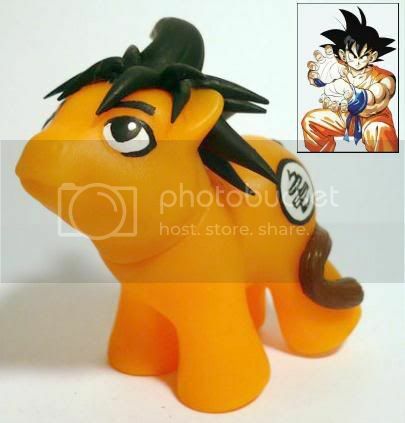 There’s less rhyme and reason in the Dragonball Evolution movie than there is in a likeness of a an outlandish Japanese cartoon character rendered not just as a pony, but… wait for it… as a baby pony. A baby pony. But, as the sheepishly-proud owner of a slightly-misshapen Batman tattoo, I probably shouldn’t throw too many stones. So, credit goes to the artistic skills of Amy (a.k.a. AnimeAmy on deviantART), who created the Baby Goku Pony (in addition to previously-highlighted Yoda, Darth Maul, and Megatron ponies) and subsequently sold it to someone at Ohayocon. Ugggghhhhh. How dare they defile my precious Ponies with that garbage. Uggggghhhhhh. How dare they defile my precious Ponies with that garbage. Previous post: CONTEST: See Your Idea Become a Geeky Cake of the Week!